If people are looking to Apple and its new smartwatch to kickstart wider consumer interest in wearable computing gadgets, the maker of the iPhone will have a lot of work ahead of it. New research out from the GlobalWebIndex indicates that in a survey of 170,000 adult internet users across 32 markets, only 9% report having a smartwatch, and 7% said they owned smart wristbands. In contrast, among online adults, 80% now own a smartphone. — Wearables. Within the wearables category, the biggest number of device owners are affluent males in the 25-34 year-old group who reside in the Asia Pacific region. This points to these smaller, portable and more narrowly functional devices continuing their market placement as niche products that have yet to find a groove to appeal to a wider range of consumers. — Platform ‘wars’ are over and Android won. Breaking out how different mobile platforms are performing in the smartphone and tablet sectors, it’s no surprise to see that Android is firmly ahead of iOS. What’s interesting to see, however, is just how far they have diverged and when. — Tablets. In tablets, to me the most interesting point is a historical one: we like to talk about how Apple and the iPad dominate tablets, and while that may be the truth as far as the single brand is concerned, when it comes to platform dominance, Apple hasn’t been in a leadership position since Q4 2011, and really dropped away from a close position in 2013. — Mobile internet use. GWI says that 75% percent of smartphone users are accessing mobile internet services on their smartphones — meaning a whole 25% are still not. The average amount of time that people are spending on their mobile devices is 1.85 hours/day, up by about 40 minutes on 2012. Because emerging market consumers often replace PCs with phones, they are using those phones the most, on average at more than three hours/day in the Middle East and Africa. — VPNs, popular content. GWI also delves into what kinds of content is being consumed on the Internet access front, and how users are getting to it. The rising tide of restrictive firewalls in some markets has led to increased usage of VPNs to access the Internet. These VPNs effectively let you appear on the Internet as if you are somewhere that you are actually not. 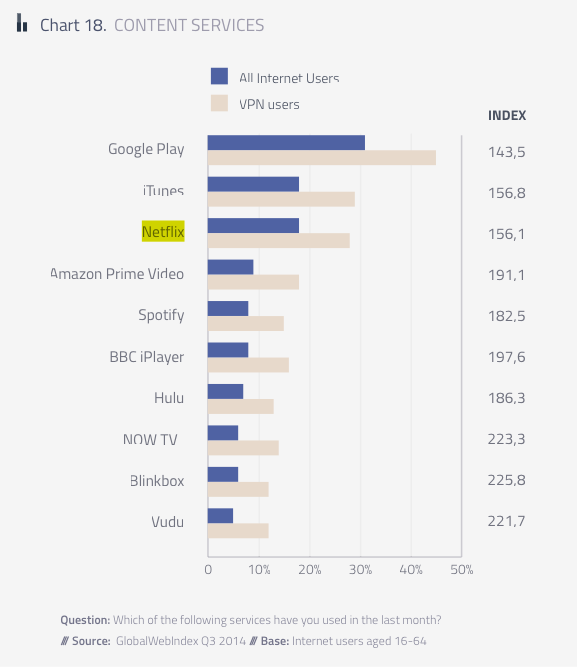 Currently, GWI says that some 27% of respondents, of 400 million users, say that they have used VPNs to go online, with China alone accounting for 150 million people.